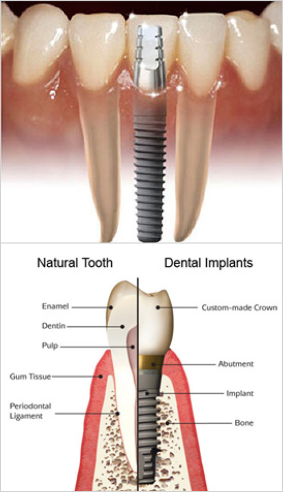 An implant is a titanium screw that is surgically placed in the jaw bone underneath the gum tissue to support artificial teeth where natural teeth are missing. Dental implants have many benefits, they help preserve facial structure, and prevent bone deterioration that occurs when there is a natural tooth missing. We recommend a consultation with our implant specialist to assess if dental implants are right for you. If you are missing bone, the foundation for dental implants, additional preparatory grafting may be necessary. 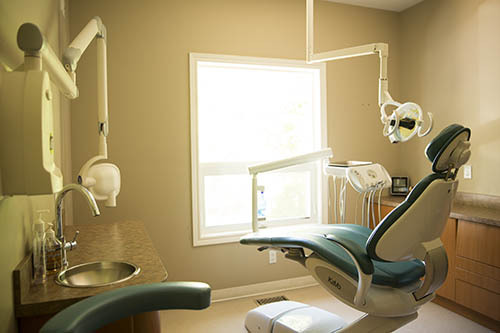 The placement of dental implants involves one-to-two surgical procedures. First, implants are surgically placed into the jaw bone and allowed to heal for 4 months following surgery such that the implants gradually bond with the jawbone. The implant may be left with a silver connection screw exposed to the mouth or covered by gum tissue and left to heal; this depends on the quality and quantity of your bone. Once the healing is complete (within 4-months), a cap will be made to fit the implant thereby filling your empty space. The entire procedure takes 6-8 months.